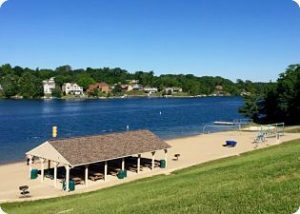 The Hidden Valley Lake beach is the perfect location for fun in the sun. Enjoy free Wi-Fi, volleyball, and play equipment. A boat dock provides convenient drop-off and pick-up from the lake. The beach is home to 2 covered picnic shelters. One is on the beach itself and another overlooks the lake from the parking area. Each is equipped with electricity, 10 picnic tables and 2 large grills. Residents may reserve the upper beach shelter for a nominal fee. • Present a valid HVL ID card at the check-in kiosk. Driver’s license not acceptable as ID. • Guests must sign in with a lifeguard upon entry. • A resident with a valid HVL ID card must accompany non-resident guests. • Pay appropriate guest fees if necessary. • 6 free guest passes per member per season for the Pool/Beach are available at the POA Office. • The number of guests per member may not exceed 8 per day, except by special permission. 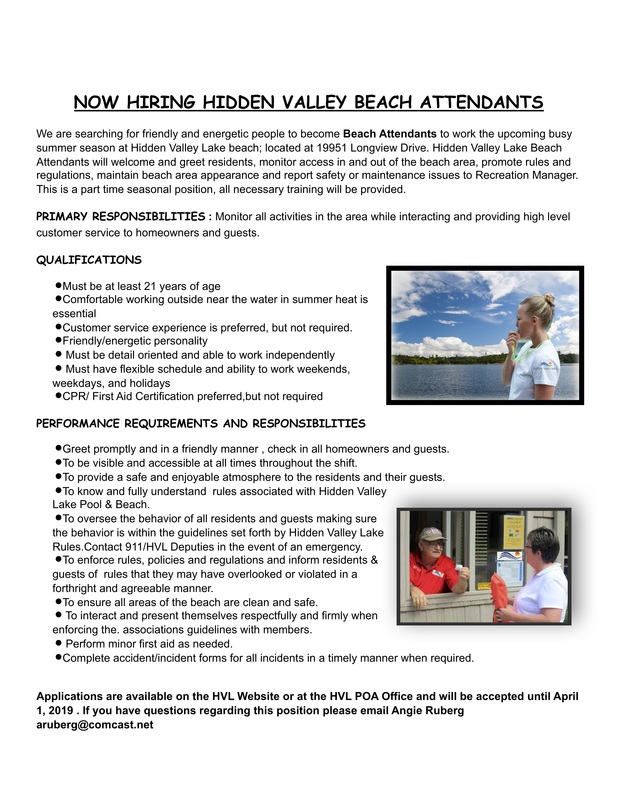 • The POA office or the Pool Manager may issue a written temporary pass. • There are no refunds or rain checks. • Purchase a seasonal Pool/Beach guest pass at the POA Office. • Swimming is only permitted within the roped-off area. • Swimming when lifeguards are not on duty is at your own risk. • Children under age 11 must be supervised by a responsible person age 14 or older. • No glass containers or bottles are allowed. • No pets allowed inside swimming areas. • Be ready to present your valid HVL ID card at any time. Drowning — not what most people expect. Drowning is almost always a deceptively quiet event. The waving, splashing, and yelling that television prepares us to look for is rarely seen in real life. In 10 percent of drownings, adults are nearby but have no idea the victim is dying. Here’s what to look for: Drowning Doesn’t Look Like Drowning. • Protect exposed skin – apply minimum SPF 15 to all exposed skin 30 minutes before heading to the beach; reapply often. Sunscreen is available at the lifeguard shack if needed. • Supervise your children – Even strong youth swimmers need constant supervision at the beach. Younger kids should wear appropriate floatation devices. Understand that floatation devices aren’t a substitute for supervision. Consider staying in the water with your children while they’re swimming and wading. • Stay hydrated throughout the day – Bring a cooler with plenty of water, juice boxes and popsicles. Know the basic signs of heat stroke nausea, irregular breathing, confusion and headache. Set up a beach umbrella or take a break from the sun under the beach shelter.